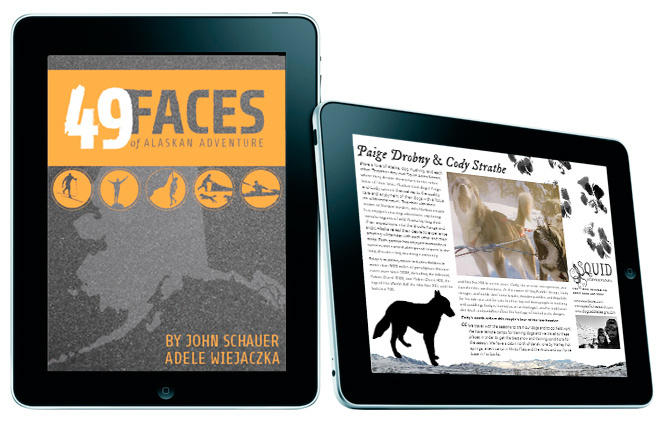 49 Faces of Alaskan Adventure is a collaborative design and digital publishing project created by Think Far Beyond and Adele Wiejaczka of Live Large Design . We will portray modern Alaskan adventurers through an interactive, media-rich iBook. Through video, landscape photos, portraits, and text, our iBook will offer glimpses into the lives of mushers, alpinists, skiers, paddlers and travelers of arctic wilderness. This new media experience is a perfect for sharing the stories of Alaskans whose lives are shaped by the wildest environments in North America. Please visit our Kickstarter campaign and consider supporting this project.